The 2017 Working Week will take place in Helsinki, Finland; the 2018 Congress in Istanbul, Turkey; the 2019 Working Week in Hanoi, Vietnam; and the 2020 Working Week in Amsterdam, the Netherlands. Should the 2021 Working Week take place in your country with you as the local host? 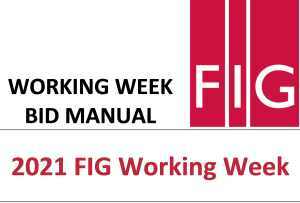 FIG invites all Member Associations to consider making a bid to host the prestegious FIG Working Week 2021 together with the Federation. The FIG Working Week will be the major event in 2021 and member associations are encouraged to consider their engagement. The Council has prepared bidding guidelines for the Working Week. The bidding guidelines explain in detail the information that is required for a successful bid. Decision on the host of the Working Week will be made in Helsinki based on proposal from the Council and evaluation report prepared by the FIG Office. The deadline for the bids for the Working Week 2021 is 15 December 2016.